A fab party game for sleepovers, and for kids parties, or family events. We've played this one a lot. You're going to need to hang each donut on a string, one per person. So, six players, six donuts hung up. Cut the string nice and long, and tie the strings around a beam, a branch or off anything high up. The donuts need to dangle at about mouth height for the players. It’s all a bit random, but you get the idea. On the command, each person must try to eat their donut without using their hands. First one to finish wins. You end up with sugar all over your face, and donuts half eaten. Hilarious to watch! Have a camera ready. - make sure you buy ring donuts, with no jam in them. Jammy donuts make a lot of mess, believe me! seems so fun, cant wait to see friends and me do it!! im going to do that for my sons party sounds graeat! It is FABOLUS GAME =] may i also recommend hanging apples to the string , aswell it may be harder but very funny! and if no one gets it within ten minutes add in that you are allowed to use your shoulders or something if it get tooo hard (it did at MY party!). OMG!!! that sounds sooo funny!! How about playing it blindfolded. I'm 13 as well and it sounds like sooo much fun!!! its great toplay when you have nothing todo score!!! 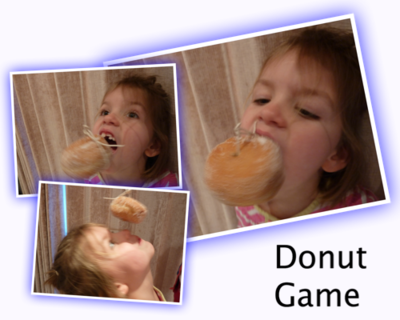 You can give this game another fun twist by hanging the donuts with yarn or string along a clothes line!